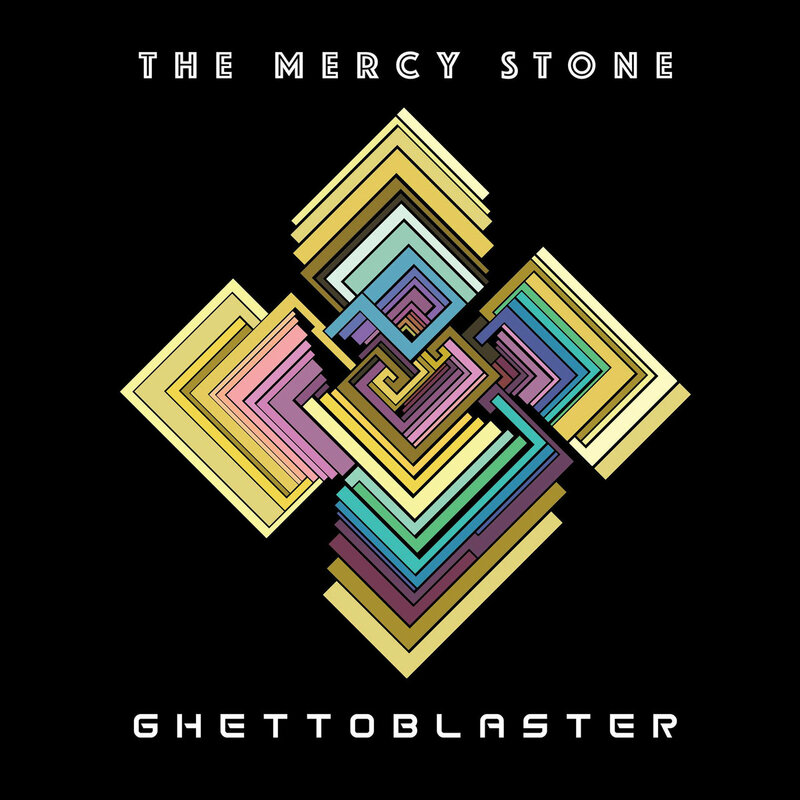 The Mercy Stone was founded by guitarist and composer Scott Grady, and is a 12-piece ensemble which goes into the unknown and unexplored territories evolving around Experimental Rock, Jazz Fusion and Classical Music. Pounding, incessant martial rhythms and a truly big bass guitar sound drive forward a true rock opera — that is the ensemble’s debut album Ghettoblaster — in the most literal sense of the word, with wind instruments that behave as a classical brass section rather than a jazz horn section, providing harmony and occasionally introducing melodic themes. The mood is bombastic, grandiose, grim, and violent. Grady’s guitar here is very much a supporting instrument, played in a jazz idiom with a clean tone, providing mostly basic comping and some brief leads. Instead, the focus is mostly on the interplay of the string / woodwind sections and the rhythm section, with the rest of the band providing a complex multi-layered harmonic backdrop or overture-like thematic statements. There’s no back-and-forth between instrumental solos or improvising on a groove here, everything is very tightly planned out and regimented. Even the track divisions are more of a courtesy to the listener as any indication of actual “songs,” as the entire album flows together as a unified composition that flows neatly from scene to scene (much like a real opera). The rock part of this instrumental rock opera comes mostly from the bass and drums, which provide a massive rhythmic impulse that resembles the brutality of Stravinsky’s The Rite of Spring multiplied a hundredfold by 20th century technology. Joris Daniel Hoogsteder’s drums and occasional anciliary percussion mix classical, rock, jazz, and military band rhythms freely, supple and subtle when they need to be, crushing and hammering in the climaxes, always perfectly on time. The bass, played by Shawn Graham, has one of the most utterly huge tones, a wall of fuzzed-out distortion the equal of two guitar players but still tight enough to not drown the mix in mud. The sax playing here shows the instrument’s abilities both as a percussion and a “on-its-own” instrument, backing up the rhythm section with one hand while mediating between it and the rest of the band with the other. The production is excellent and fitting with the band’s jazz roots, prioritizing fidelity and soundstage over stylization. Every instrument is clearly audible and distinguishable from the others, even when they’re all sounding at once. The drum production deserves particular praise, as all of the fine details of the cymbals and trap drums are preserved, instead of dissolving into a high-pitched ringing like so many other albums. Structurally, this has scant resemblance to any kind of rock or jazz music. It’s mostly built out of ostinatos, upon which are built layers and layers of harmonies, the tension building and building, higher and higher, louder and louder, faster and faster, until the passage consummates in a massive eruption of energy — bass, drums, winds — all working to leave the listener completely overpowered. The magic comes in the resolution coming always on time and being both consistent with what came before and a musically interesting departure. The marriage of Wagnerian motivic development and psychedelic histrionics works beautifully, and by keeping the whole thing fairly brief it’s made much more listenable than an actual Wagner opera, with very little fat. Ghettoblaster is strange, off-kilter, obtuse, but also beautiful, a tapestry of weird and wonderful musical imagery and a masterwork of composition. It is not for everyone, perhaps not for most people, but for those who get it, there is little else in the entirety of recorded music that can so powerfully and completely transport you to another time, another place, another state of mind. Highly recommended for fans of progressive rock, jazz fusion, and challenging, advanced music in general. Get a copy of Ghettoblaster from this location.